Too bad. From AudioBlogger. It was a nice service that I used a few times. But their note points to others that will fill the space. I'm going to post some of the reviews/links that SoundAbout is getting here. My earlier post about it is here. 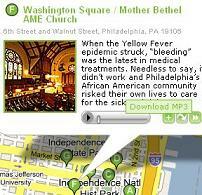 Philly Sound and Maps Mashup - Here is a fantastic new Google Maps mashup from the "Official Visitor Site of Greater Philadelphia" (gophila.com) that combines sound with Google Maps. It's called Sound About Philly. Various guided audio tours bring you through Philadelphia's history, "flavorhoods", and residents' perspectives of this great city. You can also create your own sound mapmash and leave it for others to view. It's a model mashup for other city tourism sites! Philadelphia has a promotional podcast. The news is that as a walking tour, it's not totally lame. The idea behind Sound About Philly was to create a series of audio bits for visitors and locals to hear while sauntering around town with an iPod - or for someone listening in Peoria by laptop. American Express commissioned some neighborhood tours with everybody's favorite NY guide Barry Lewis and Billie Cohen from TimeOut NY. She plays the David Hartman role with fun comments as he lectures and towards the end she talks about places to shop and eat. They seem to be sort of general chats about they neighborhoods and I found them a fun listen. Lewis just loves the city. The audio runs 15 minutes and is filled with neat factoids and I like the fact that it seems to have been recorded outside. I also like the fact that this is not a "tour" with any sort of walk this way or look at this element. They are really neighborhood chats you don't get a real "tour" as in walking block by block. I actually like this. On the iTunes version they've placed a very rudimentary map as the album art. In all they give you a great sense of place. A gmap would have been a great addition. I kept getting stuck in the notion that if the idea of podcasting was to broadcast new “radio shows”, then letting someone randomly select artist interviews to listen to wasn’t the same as a podcast. But really all a podcast is is a list of MP3s one can download, they don’t neccesarily have to be in order, or flow together, or be time sensitive. When thought of like this it makes more sense. We can publish our entire list of available artist stops online in our podcast RSS, and people can then select which works interest them, and only download those specific MP3s. So the idea still works. 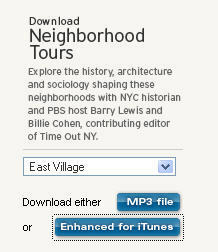 But we don’t want to limit the ability to recieve these MP3s to podcasts or podcast software. So in addition to building a podcast RSS feed for people to use, we’re going to build an index list online in the Art on Call website, for people to check off which work MP3s they want to download and then let them take those files and put it into their iPod from the web itself. This gives people without a podcast reader, or iTunes, or even an iPod, a way to get the same audio from our website. In reality, we’re just distributing MP3s, so why not give people some different options on how to recieve them? Article about cellphone based audio tours for museums. More on this as Acoustiguide offers cells phone tour service. They are not down for the count in this space. The Walker Art Center's blog posts on the development of their Art on Call service. It follows the emerging space very well. Turnhere.com looks like a well funded new startup aimed at local video but with a strong neighborhood tour and home tour angle. There is a tour of East Hollywood and also one of the penthouse apartment in the Piano Building in NY. Yahoo mapping is one way to navigate. 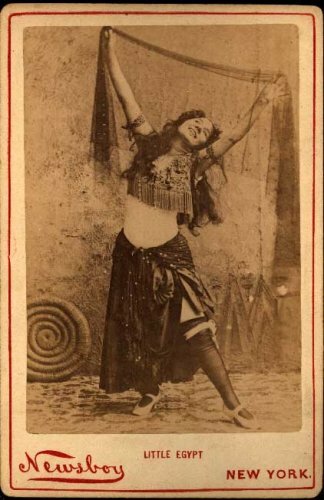 A short podcast about Little Egypt, the exotic (for Victorian Times) dancer who met an untimely end around the corner from my office in the early 1900's, at 226 West 37th Street. 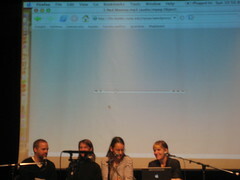 This morning I attended a few sessions of the Knowing the World Through Sound Symposium at NYU. I wanted to see the first panel about the New York SoundMap that is being created by the NY Chapter of the American Society for Acoustic Ecology. The* NY Sound Map is a Google map mashup which links to audio clips of sound recorded in the urban environment. Nice start. They handed out a great list urban audio ecology projects that I've listed below. It really opened my ears to what a vast field and way of thinking. some people map decibel levels, others through soundwalks create more meditative experiences. The work below has already made me broaden some of the audio ideas I'm playing with. Some of the links below are very academic in nature. Ones with *'s seem to approach more of what I'm interested in. Noise mapping concept for the uk sound map. *Puget Sound Soundscape - yes that means unbderwater sounds! * NE Scotland Soundscape - including some background noise from one of my favorite distilleries. Starting December 5th we will all be able to download a weekly podcast show by Ricky Gervais from the Guardian's web site. But they have decided not to go back to the GCap-owned London station, and will instead make the programme available for download over the internet. "I want to do a radio show where I can say what I want, when I want for as long as I want and that's free for anybody who can be bothered to listen anywhere in the world," said Gervais. "We didn't want it to just be the best bits of a radio programme you'd missed so this is a show that is straight-to-Pod-cast. I suppose we're trying to create an exclusive club. We'd prefer this to be a few people's favourite show than a huge samey ineffectual broadcast." The SF Chronicle has several podcast tours up on their site. Two of the De Young Museum and two of the food scene in North Beach. Yum. These are posted on a blog with comments, permalinks etc. The NYT has a small article in their Sunday Education Supplement about podcasts of lectures at Purdue and other schools. Here is the link to the Purdue Podcasts. I think it will be fun to listen to some of the agricultural ones. IT Conversations - "New idea through your headphones." -- for you to view, listen to, stream or download. The Little Gray Book Lecture series podcasts.